The production of the Kuga started in 2008 and since the model already undergone a facelift in 2010, Ford decided to reveal a brand new model earlier this year at the Geneva Auto Show. 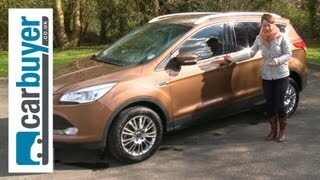 The Ford Kuga 2012 was born, bringing along with a larger boot, new technologies and lots of improvements. Under its hood the new Kuga conceals the 1.6 liter Ecoboost engine found on the ongoing Focus and C-Max. Although the exact horsepower output has not been revealed, we know that the Ecoboost engine can develop somewhere between 150 and 180 horsepower. The second and third choice comes as a 2.0 liter TDCi diesel engine that develops either 138 or 161 horsepower, depending on the variant. The new Kuga also comes with four-wheel drive and a six-speed manual transmission as standard, but a twin-clutch Powershift transmission will be made available as an optional extra. The exterior design of the new Kuga has been heavily inspired by the Vertrek concept we've seen last year, with which shares lots of aesthetic similarities. Nevertheless, underneath the bodywork the Kuga shares the same chassis architecture with the Ford Focus and C-Max, and is now offering a more generous boot than its predecessors. Besides the larger 442-liters boot the new Kuga offers slightly more legroom for the back seats which now fold flat with a touch of a button. As expected the new crossover comes with loads of new technologies including Ford's SYNC in-car connectivity system, Active Park Assist, Blind Spot warning system, TVC system which helps handling in the curves, voice control and a new "hands-free" tailgate that automatically opens and closed when kicking your foot under the rear bumper. Features expected in the base model are IPS, ABS, DSC, traction control, emergency brake assist system, driver and front passenger airbags including side thorax and pelvis airbags and driver and front passenger belt minder. 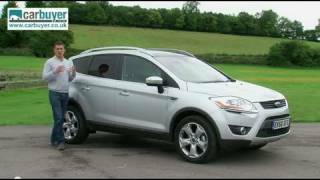 As far as availability goes the new Ford Kuga 2012 is expected to hit the UK automotive market in early 2013 at the base price of £21,645 (roughly $35,000) and will have to go up against the Land Rover Freelander and the Volkswagen Tiguan. 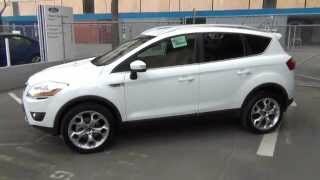 The US variant -dubbed Ford Escape 2013 - is expected to hit the showrooms starting this fall, at an estimated base price of $22,470.